The STATE OF THE UNION Address aired on 4 networks, scoring highest on NBC. ABC: AMERICAN HOUSEWIFE moved to Tuesday, and dropped 0.2 from its last Wednesday airing to 0.8. THE KIDS ARE ALRIGHT was steady at 0.8 with its last airing, even though that had a lead-in that was nearly twice as high (1.5 for the season finale of THE CONNERS). 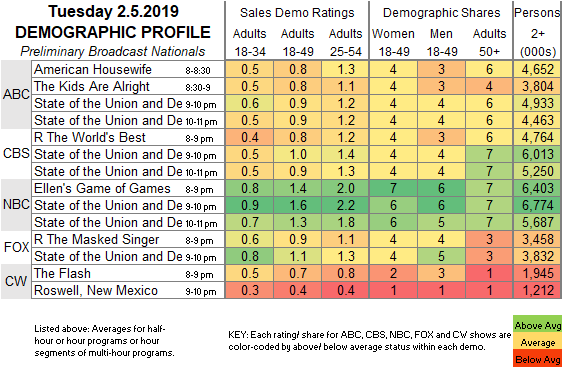 NBC: ELLEN’S GAME OF GAMES lost 0.2 from last week’s 8PM episode to 1.4. CW: THE FLASH held at 0.7, and ROSWELL NEW MEXICO took advantage of being the only network show airing against the speech, up 0.1 to 0.4. 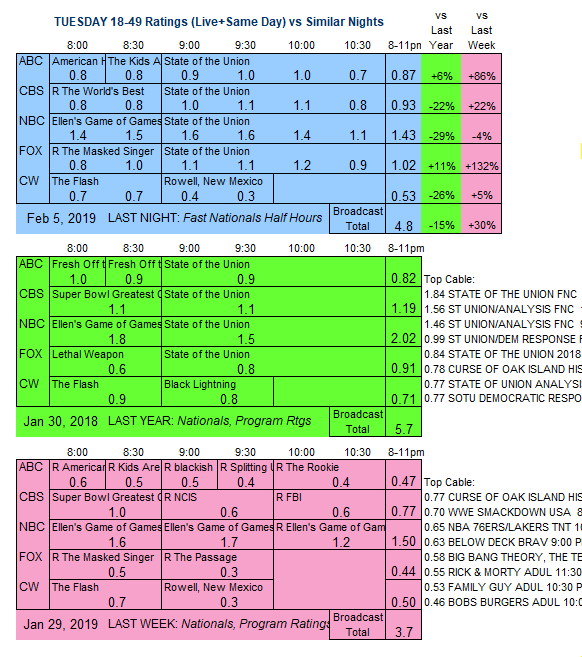 CBS: A rerun of the post-Super Bowl premiere of WORLD’S BEST at 0.8. FOX: A rerun of THE MASKED SINGER at 0.9. Tonight, CRIMINAL MINDS concludes its season, airing after a 2-hour WORLD’S BEST.